If you are looking for a good or decent fax app for iPhone, you may have been stunned by the sheer number of iPhone fax apps available in the Apple App Store. 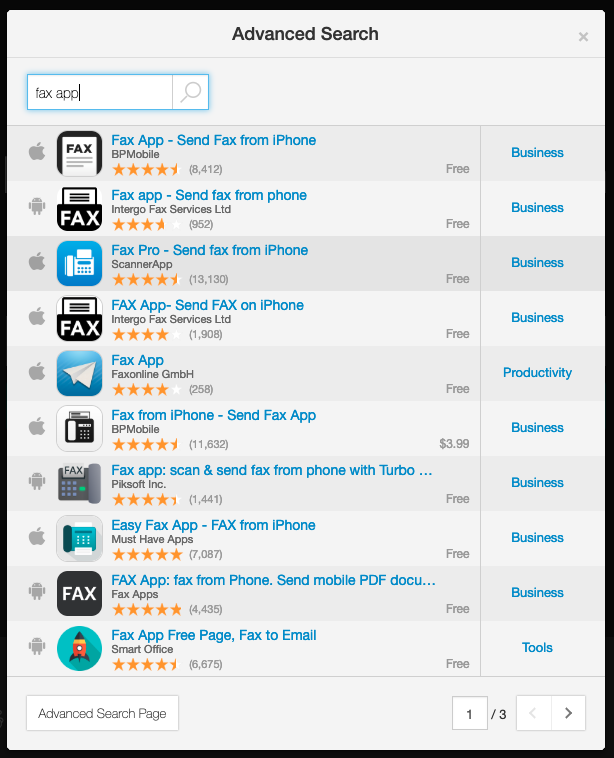 We punched in the query term "Fax app" or "Send fax" in the App Store this morning, and counted over 100+ similar apps. One thing you should know is sending fax through such apps are usually not free. Unfortunately developers do incur high costs to run the service to send faxes on your behalf. As a result, almost every fax app for iPhone you see in the App Store are paid apps requiring at least $10 to get started. For those who are looking for a free fax app or one that is just not too expensive, looking for a reliable one is quite time consuming, but very rewarding when you manage to find it. For selecting a good, well-valued fax app for iPhone, you should follow these 3 little-known tips. Remember we mentioned that most fax apps aren't free? Well, that is still true, but some fax apps out there actually offer free trials for their fax service. A free trial, or some free credits would be a good way of evaluating the service for free before committing and deciding to pay for one. Since free trials usually last for 3 days for sending unlimited number faxes, you could even have enough time to send free faxes without paying a single cent. Almost every iPhone fax apps allow you to send outgoing faxes, but not all support or allow you to receive incoming faxes on iPhone. The reason is not all fax apps work with local and international carriers directly to be able to provide users with private fax numbers. If your fax app does not let you receive incoming faxes, you may need turn to a a fax machine for that. However, Fax machines are have many inconveniences such as being really bulky and requiring landlines to operate, which we think is an absolute no for small teams and small businesses today. Therefore, it is absolutely essential of picking a fax app with the ability of receiving incoming faxes on your iPhone. You can either pick one that assigns you with a random fax number or even let you pick your own permanent fax number. Sometimes, you may need to send just one more fax, and the cost of paying for another credit pack just does not make sense. In that situation, getting a fax app that allows earning of free credits can save you from making another purchase. These apps allow you to earn credits by performing some tasks. Unfortunately, very few apps offer this at the moment. This is kind of a no brainer. You should only download apps with a very strong rating (3.5 Stars and above!). High ratings with a very large number of ratings is a clear signal that it is a good app. You could say for a fax app with good rating the general crowd has already voted for this app and is recommending this app to you. With the above tips, you must be wondering: Is there a fax app for iPhone out there that checks all these boxes? The answer is yes. Fax Zap for iPhone is a free fax app that offers private fax numbers, for both sending outgoing faxes and receive incoming faxes. You can start the app with the free 500 credits or even start a free trial to try it out for free for 3 days, and it is even supported on iPhone 6. 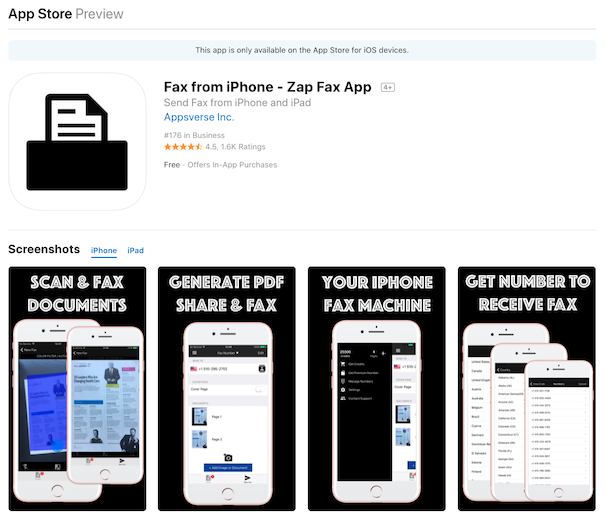 More importantly, Zap Fax is one of the highest rated Fax app for iPhones, and with over a million downloads.